When the NCAA playoffs roll around I think of Mother every year. She was a huge college basketball fan. Her favorites were Kentucky, and, after I went there, Tennessee. Even after she had had strokes and was in the nursing home she still liked to watch the March Madness games. She couldn’t say much about the games but her dark eyes were alert as she watched the boys run up and down the court. She liked the women’s games, too, once they started televising them. Mother played high school basketball herself at Woodlawn School, a country school which didn’t even grant a diploma when she and Daddy were there. 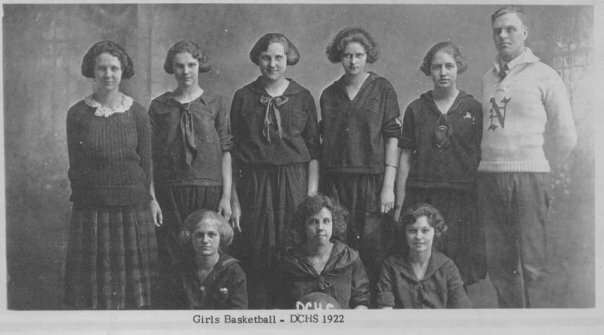 Girl’s basketball in those days was a different animal from now. In fact, it didn’t change until 1970. Girls played in half courts. Let me explain. Your team’s defense couldn’t cross the center line, and your team’s offense was on the other half of the court and couldn’t cross the line. The opposing team had the same restrictions, so as a defensive player your entire object was to get the ball to your offense at half-court so they could run and score. I think the logic was that girls couldn’t or shouldn’t run the length of a basketball court. Can you imagine? But, honestly, this was the accepted method for girls to play (in baggy uniforms and mostly covered up.) By 1970 people were getting used to the idea that girls were not delicate flowers. I mean, how do you think a man would hold up in childbirth? Seriously. I was always sorry Mother never got a chance to play full-court basketball. When I was a kid she would shoot baskets with me, but she was very heavy and got out of breath pretty fast. I can imagine her as a willowy young girl, racing down the court and shooting. She would have been pretty good.